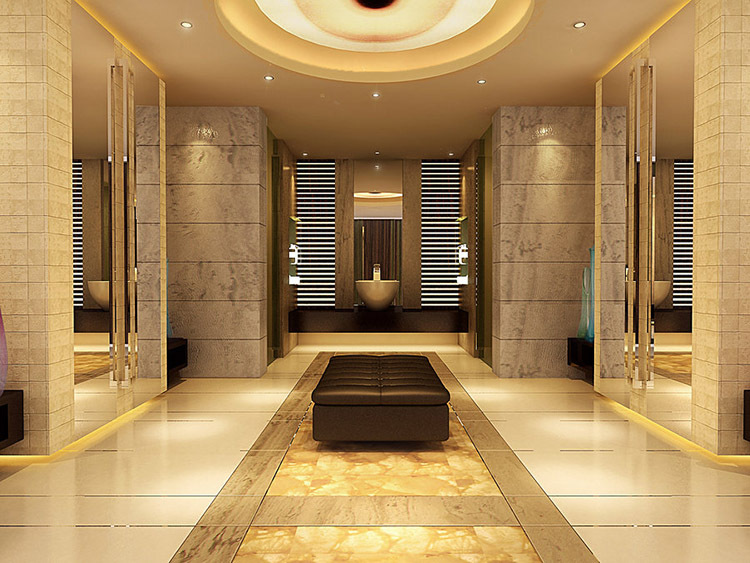 Asian bathroom designs always show a clever combination of modern and traditional elements. West and East have been always influencing each other, after all. Japanese and Chinese traditions, for example, have been a great source of inspiration for every Western designers since the XVI century. 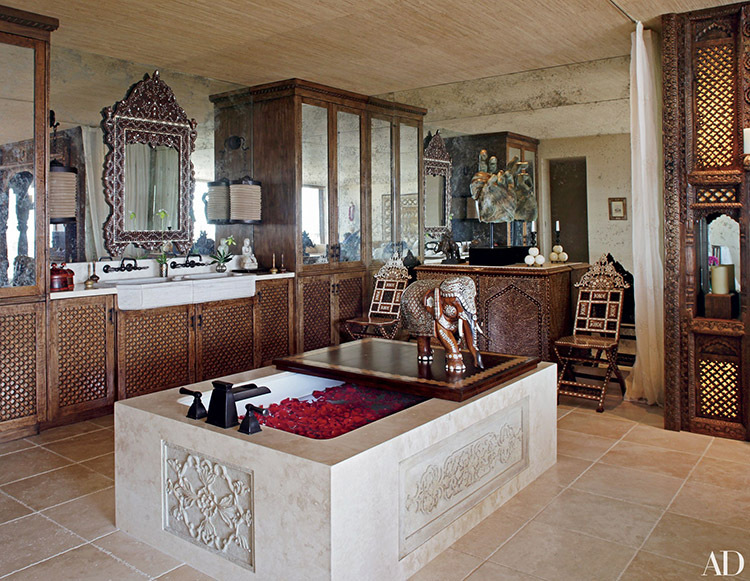 In this photo gallery, we are going to explore 20 cool examples of Asian bathrooms, from some that are clearly inspired by the Far East traditional design, to some others that are more in relation with the Arab, Indian and Persian traditions. By looking at these examples, you will certainly find inspiration and ideas for your own design projects. 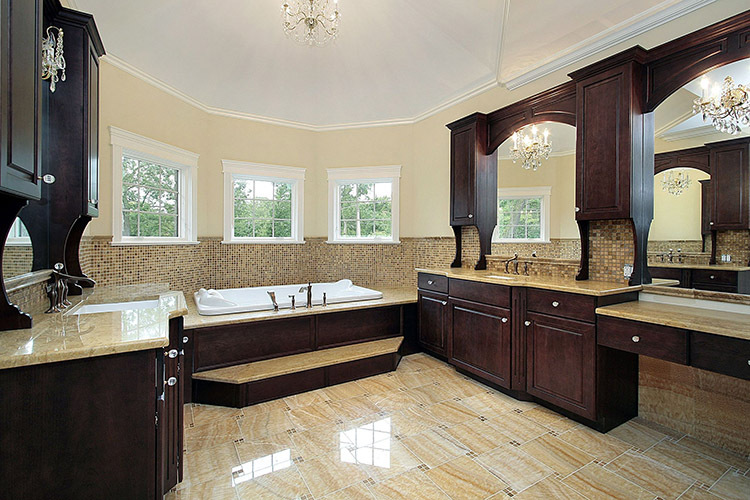 Precious wood furniture is a constant in any luxury Asian bathroom, like the above example clearly shows. The spacious dressing table on the right has wooden panels in dark walnut, a colour that is repeated in the towels and bathmats. 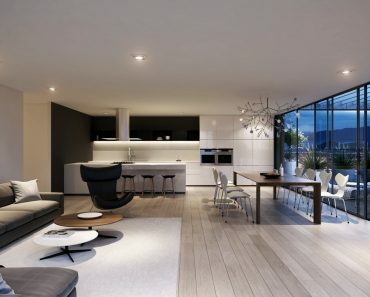 It perfectly matches with the light cream colour of the floor and the walls. Some elements taken from the traditional Japanese art (notably the fine corner where there is the wooden counter that supports the washbasin) are masterfully combined with western elements in this nice example of Asian bathroom design, in order to create an environment that is both elegant and practical. 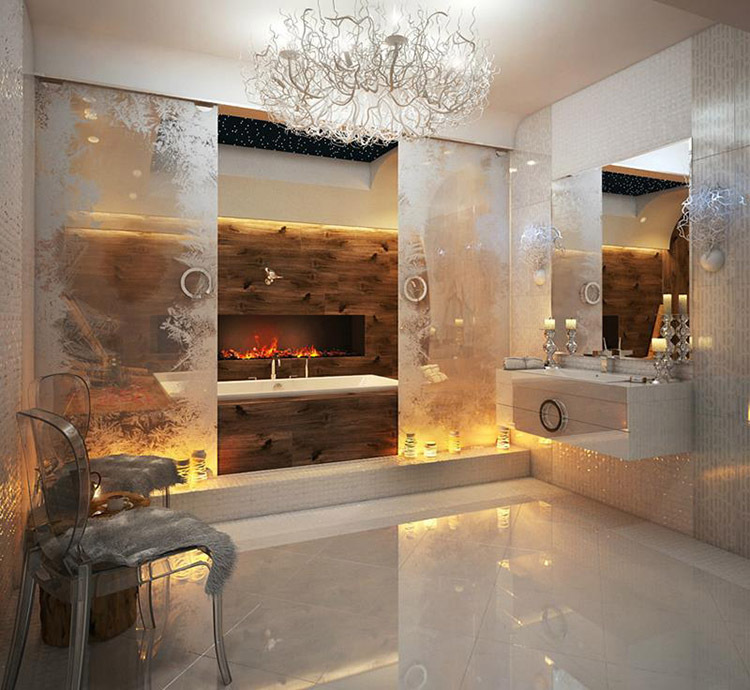 In this design of Asian bathroom, an unusually warm and cosy effect is created by the white of the Chinese style decorations of the glass panes and the shimmering tiny tiles on the wall in combination with the walnut colour of the mantel and bathtub base wooden panels. Asian bathroom designs often utilize floral motif decorations and oval shapes, as the two vanity mirrors in the above example clearly show. 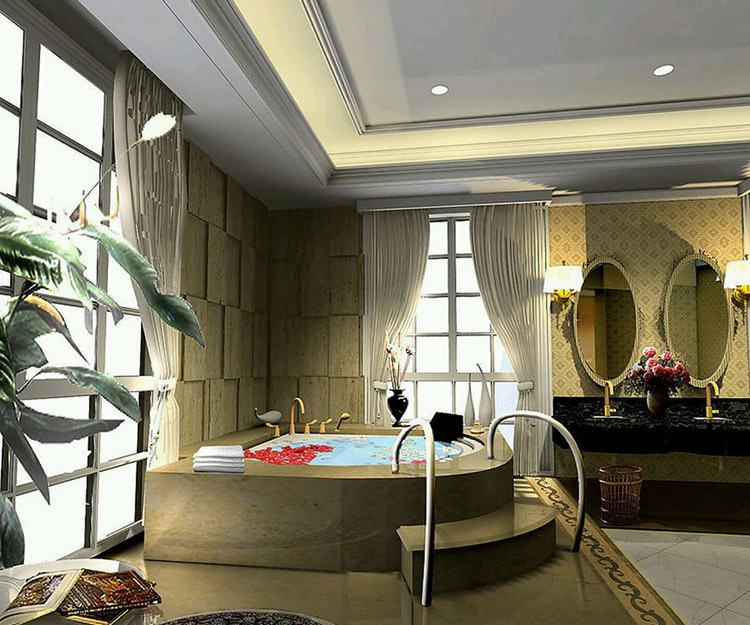 Notice the posh golden fittings that add a touch of extravagant elegance to the composition, and the gorgeous Jacuzzi with base in marble that looks like a small swimming pool. 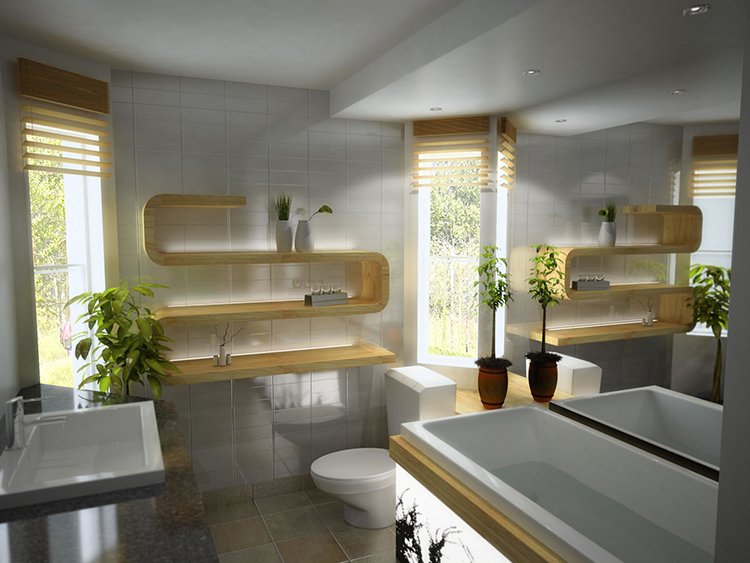 Again, an example of utilization of wooden furniture in this classic Asian bathroom. In this design it has been used the same palette of light cream, dark walnut and white of the design of the first photo, but here the layout is more functional. The two dressing tables fully equipped with spacious cabinets, vanity mirrors , drop-in washbasins and quality fittings give you and your guests a high level of comfort. 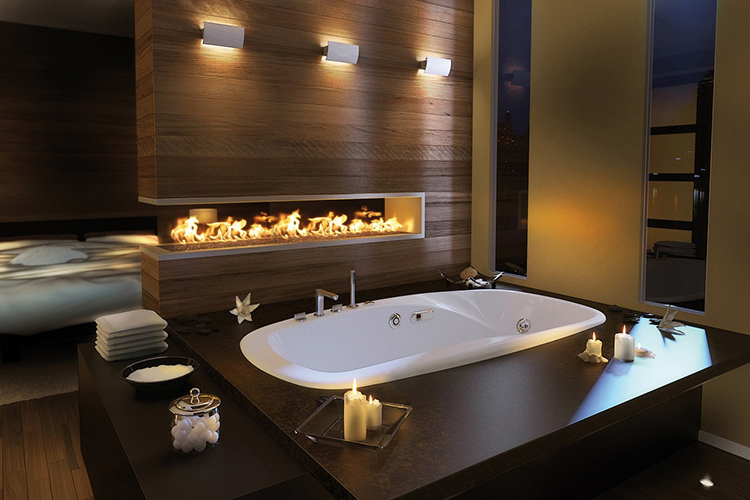 The bathtub has been placed near the bed in this innovative design that combines bathroom and sleeping room all in one. The fireplace is fuelled with gas, a solution that is both practical and environmentally friendly. 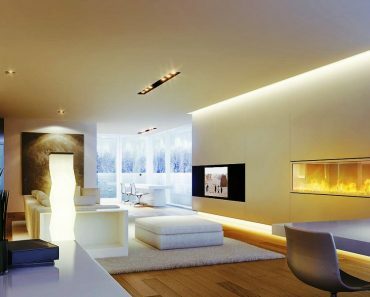 A warm and cosy atmosphere is generated through the utilization of a classical palette of white and dark walnut and wooden panels. 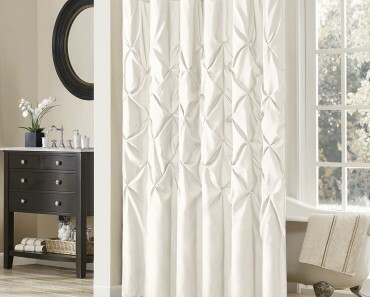 Combos are trendy in contemporary interior design. In the above example, we see an environment that combines a living room with some features of the bathroom, notably the outstanding bathtub built in a brick base that reminds an ancient fountain of a Middle East town. 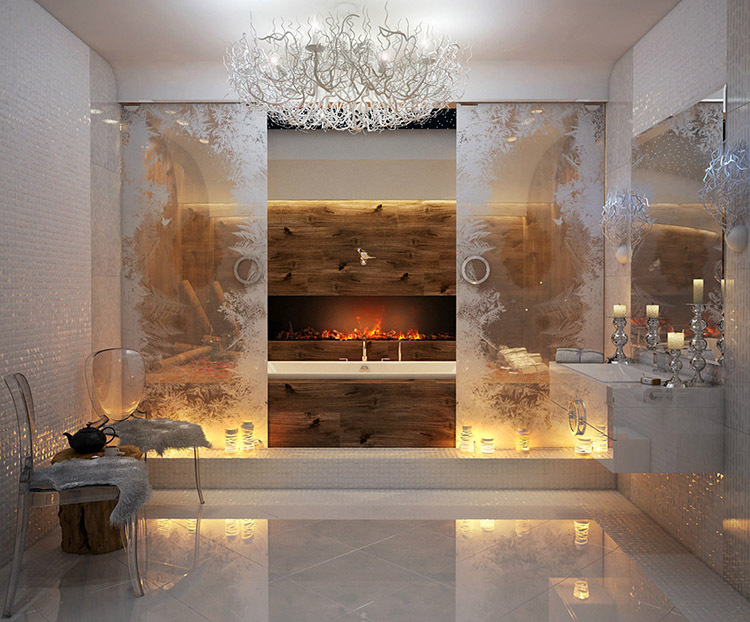 Western and Persian elements have been combined in this luxurious Asian bathroom where the space is organized around the big fireplace set in the middle. 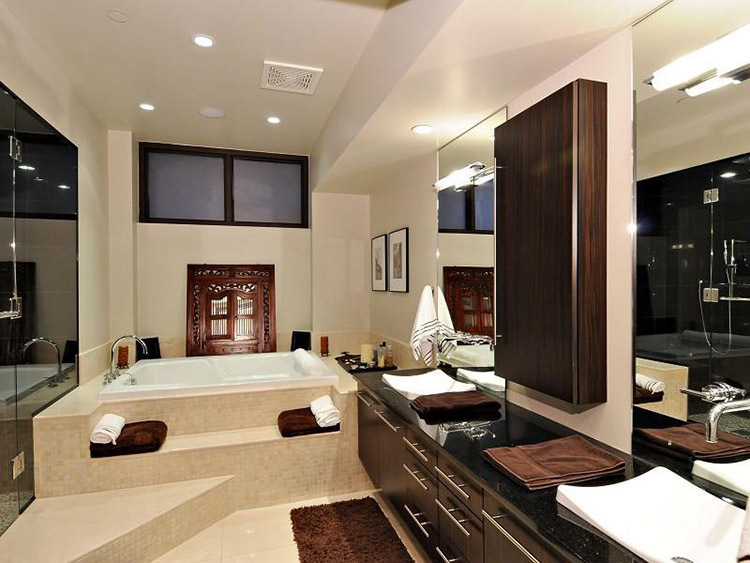 A long and spacious counter runs all along the wall and provides you and your guests with a comfortable dress area, while the wide Jacuzzi built in a base covered with marble adds a touch of exotic charm to the whole composition. Many elements of Far East design are present in this example of Asian bathroom that perfectly merges functionality and aesthetics in an airy and roomy environment. All the necessary comforts are ensured by its huge shower box with transparent panes, some spacious wooden cabinets and huge mirrors, two dressing tables with washbasins and, finally, the Jacuzzi set just in the middle of the room. The big wall mirror creates an optical illusion that makes this Asian bathroom look much more bigger than it is in the reality. The furniture is embellished with some elements taken from the Chinese and Japanese design tradition, like the nice decorations on the sides of the base of the bathtub, the fine vase by the freestanding washbasin and the elegant S shape of the shelves. 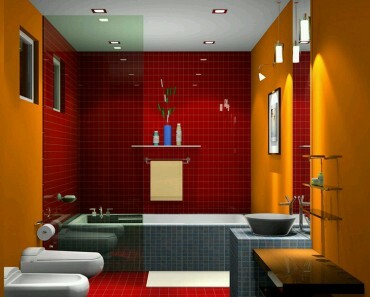 Japanese design tradition does it best in this tasteful Asian bathroom design. 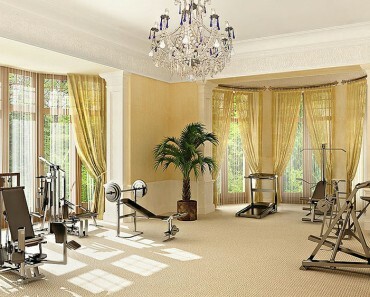 Space is so masterfully optimized that you can move at ease through the roomy yet not too big room. The furniture is minimised to a practical dressing table with two small drop-in washbasins with fine fittings and a wall towel rack. 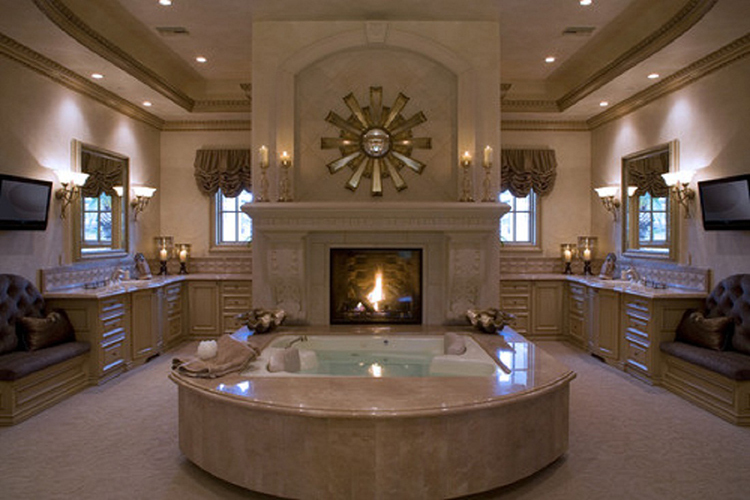 Notice the spacious Jacuzzi and the big shower box. 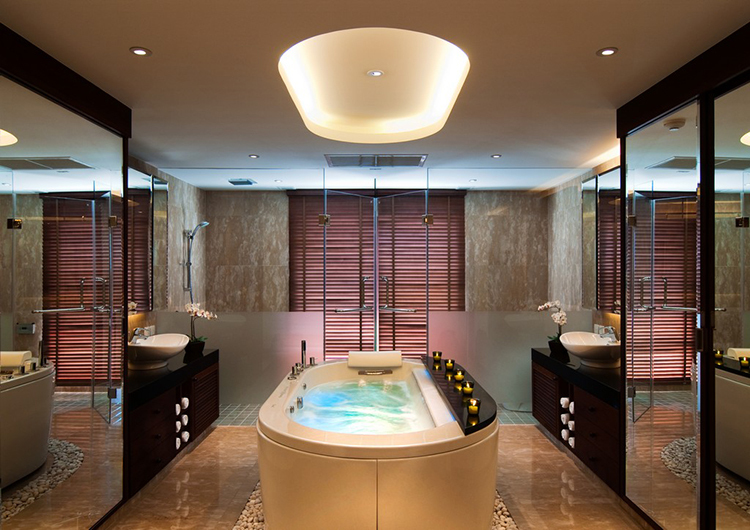 The Asian tradition peeks out in the oval shapes of the washbasins and the Jacuzzi container in this luxury bathroom. 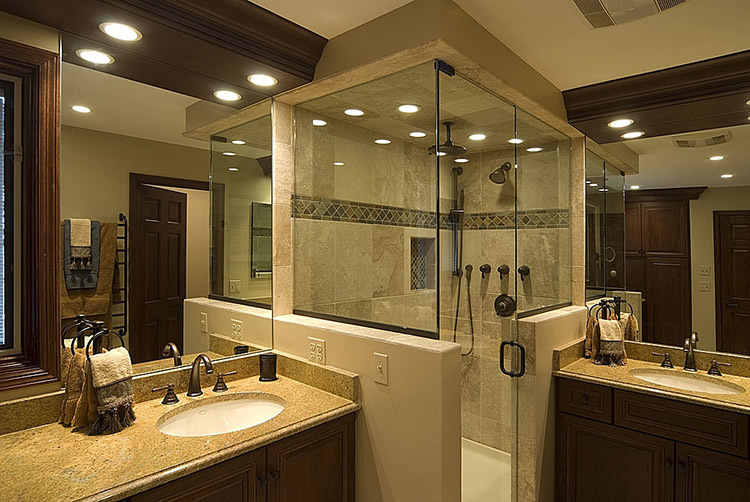 The spacious counter and the two big wall vanity mirrors provide you with a comfortable dress area, while the shower box in the corner and the big Jacuzzi are great not only to wash but also to relax and spend some time by oneself. White is dominant in this Asian bathroom design that takes many elements from the Chinese tradition, like the nice decorations on the glass panes and the round knobs. The dressing table is simple but practical, while the big Jacuzzi with fine fittings near the fireplace provides you with a great place where to relax and spend time by yourself. An example of nice Asian bathroom design that merges classic Indian and Tibetan elements, like the precious inlays on most cabinet wooden panels and the sophisticated decorations with abstract motifs on the sides of the bathtub base. Observe the unusal shapes of the fittings. The palette of white and dark brown combines with the furniture classical shapes and lines in order to generate an environment that is both functional and elegant in this cool design. The huge French windows provides you with a nice view on the outside, while a smart layout leaves a lot of room and makes this Asian bathroom particularly comfortable. 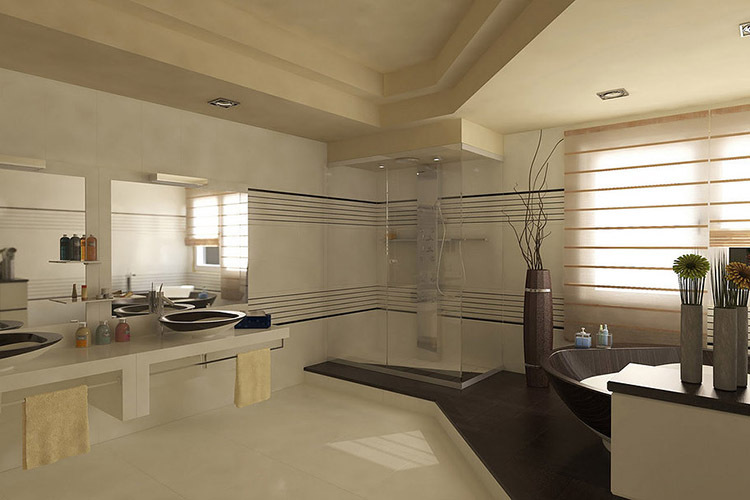 A nice example of spacious and comfortable corner shower box is shown in this detail of bathroom design. In the background we see some big wall mirrors that make the room look greater and two large dressing tables with drop-in washbasins and fine fittings. 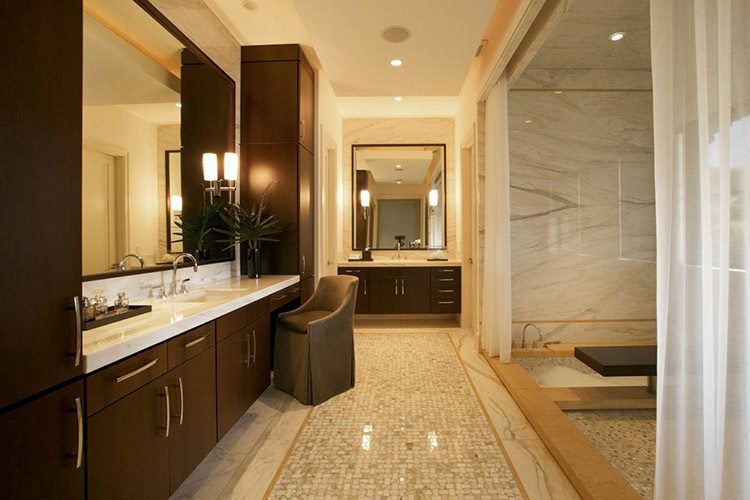 Classical Roman and Greek elements, like the mosaics, and modern furniture merge in this luxury bathroom design. Notice the spacious counters equipped with drop-in washbasins, silver fittings, huge wall vanity mirrors and wooden cabinets, and the large bathroom shaped as an ancient Roman pool that provides you with the best possible comforts for relaxation and pleasure. 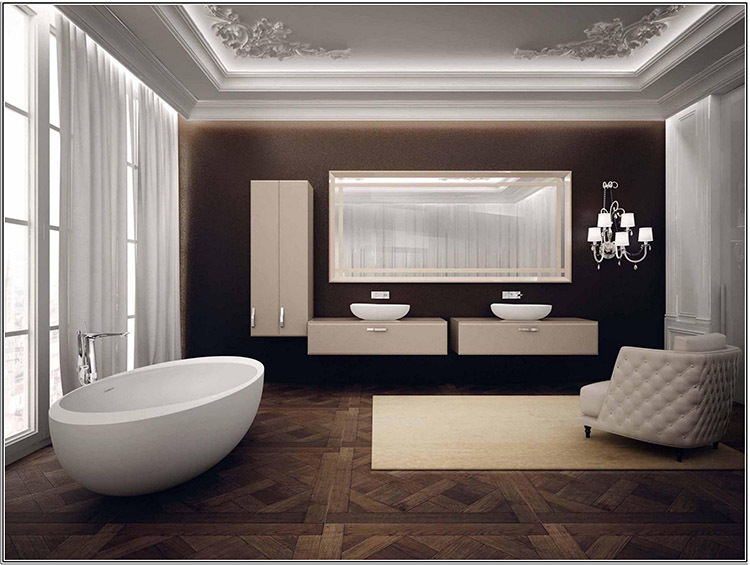 A typical example of Asian bathroom design with wooden panel furniture, posh fittings, large wall vanity mirrors, vases and marble tile floor. 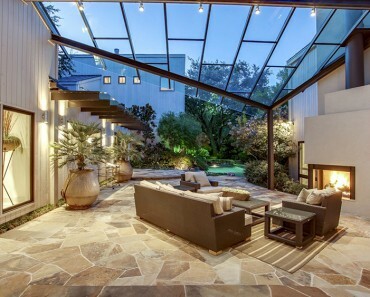 The big French window gives a nice view on the beautiful garden and makes the ambience airy and bright. 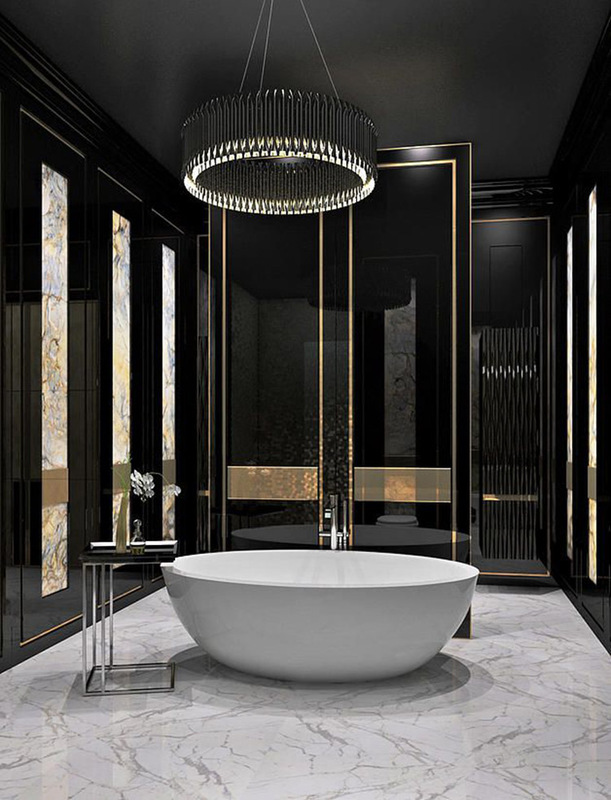 This bathroom is evidently inspired by the Middle East design, as it is clearly proved by the many citations of the Arab tradition , like the lacquered black wooden panels, the oval Jacuzzi, the white marble floor and the luxurious chandelier. Practicality is high thanks to its smart layout and the essential furniture design. 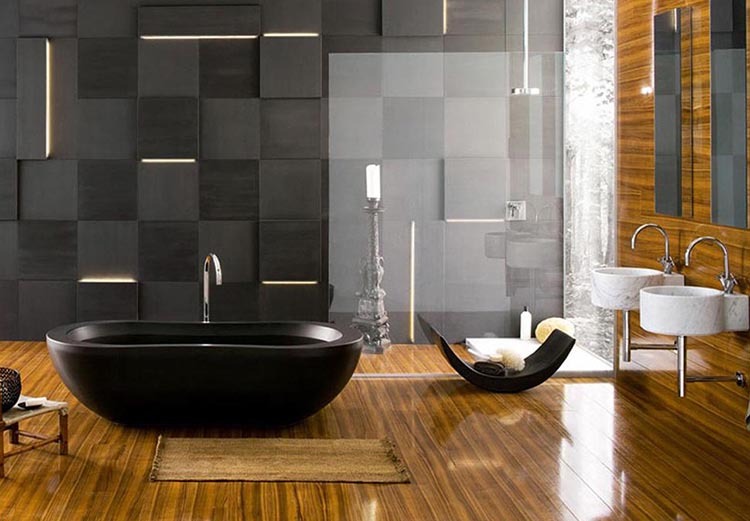 All the typical elements of Far East design are present in this cool example of Asian bathroom, like the wooden floor, the ethnic mat, the round freestanding washbasins with fine fittings, the minimalist vanity mirrors and the wall decorations made with squares in different shades of dark grey. Simply beautiful.